Environmental activists have put Florida Power and Light on notice: they will use the federal Clean Water Act to sue the company for polluting Biscayne Bay with industrial wastewater used to cool the Turkey Point nuclear power station. At a news conference outside Miami City Hall, on the shores of Biscayne Bay, members of the Southern Alliance for Clean Energy and the Tropical Audubon Society Tuesday revealed they gave FPL the required 60-day advance notice of the lawsuit on March 15. Their main complaint: the two- by five-mile unlined canal system that cools water used in the plant is leaking into the adjacent bay, according to the notice of intent to file the citizens’ suit. It accuses FPL of "ongoing, serious violations of federal law and permitting requirement" and vows to file suit unless state or federal environmental agencies sue the company first. "We're stepping in because of, in essence, the shredding of the regulatory safety net that should be in place," said Stephen Smith, executive director of the Southern Alliance for Clean Energy. State Rep. Jose Javier Rodriguez (D-Miami) said Gov. Rick Scott's Department of Environmental Protection has been derelict in siding with the utility instead of the public health and environment. "Enough is enough," he said. "How long are we going to continue waiting for DEP to act and protect the public instead of continuing again to shield Florida Power and Light?" In a phone interview, FPL's chief communications officer said the utility is already working with the Environmental Protection Agency to protect the bay. "We're not concerned in the sense of EPA being involved," said FPL's Robert Gould. "We have been involved with the EPA and proactively engaging with them on the situation at Turkey Point." FPL's federal permit does not allow it to discharge waters directly into the bay, and the utility does not do so. But the complainants say recent testing proves the canal system and bay are linked by "hydrologically connected ground water." While there is no direct surface water connection between the bay and the canal, new tests show high-salinity groundwater under the canals is reaching the bay. The greatest exposures are coming at deeper depths near the berms that are supposed to separate the bay from the canals. Higher levels of salt, ammonia and phosphorous found in those tidal bay waters were linked to the plant by tritium, an isotope of hydrogen that is found in elevated levels in water that passes through nuclear power plants. The tritium concentrations found in the bay have reached only about 20 percent of the maximum level allowed for drinking water, so the radioactivity in the water is not considered a health threat. But the nutrients being deposited in the bay are a concern because they can lead to algae blooms that block sunlight, destroying vegetation and starving animal life. "We know those chemicals have an impact on fish and wildlife," said Laura Reynolds, a longtime activist on Biscayne Bay now consulting with SACE. "We know it degrades sea grass. We know high salinity brings diversity down. So we’re worried about the marine life, we’re worried about the future of Biscayne Bay and we need immediate action." "At the end of the day, we're going to fix that problem," said Gould, the FPL vice president, noting the utility has just sought permits to remove nutrient-rich waters and vegetative matter it suspects is contributing to the levels. "We're not running away from our responsibility regarding the nutrients." Biscayne Bay is a protected water body and the citizens’ notice to sue alleges FPL violates state law by causing “degradation of water quality” in the bay, which borders the plant just to the east. 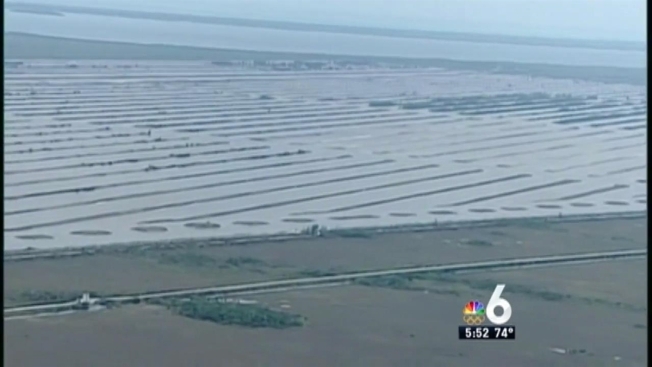 Gould said there's no evidence of FPL causing water degradation in the bay beyond the lower depths of man-made trenches just outside the plant's berms, the areas FPL has vowed to restore. To the west, hypersaline groundwater originating under the cooling canals has stretched more than four miles, toward wells Miami-Dade and Monroe counties rely on for drinking water. The utility has undertaken a project seeking to stop the flow of hypersaline water toward the wells. But the groups also say they will sue FPL for degrading that groundwater, as well. By resorting to a federal court action, the complainants are bypassing the state Department of Environmental Protection, which an administrative judge recently found has failed to stop FPL from potentially endangering the county’s sole source for drinking water. The judge threw out a deal FPL reached with DEP, noting the state could have acted more forcefully to protect the waters. The agreement does not require FPL to "come into compliance with standards" or set a deadline for it to do so. The judge’s recommended order, which can be appealed, calls on DEP to rescind its agreement with FPL or at least amend it so it enforces existing environmental laws. Mike Sole, a former head of the state DEP and now a vice president for FPL, told NBC 6 Investigators he interacted with his former agency to reach the agreement that a judge has found lacking. "Obviously there's some disagreement with the judge's ruling," Sole said, adding, "but we look to DEP for their final decision on the recommended order."